A massive crowd of thousands has gathered. Spectators fill the coliseum as a collective roar of excitement fills the air. Athletes from around the world have come together in Athens for the first modern Olympic Games. Only the finest have been chosen, those at the top of their game. All focus has shifted to the track and field events. Those with lightning speed skill and unprecedented agility will come out on top. The year is 1896. The wooden hurdles are set in place and embedded in the ground. Perfect jumping ability and running skill moves the winner through the first ever 110-meter hurdle event at a record time of 17.6 seconds. More than 100 years later, Aries Merritt utilizes his running ability to sprint, hurdle, and sprint again, maintaining steady momentum and keeping a steady center of gravity to clear 10 hurdles in the 110 meter race at a new record time of 12.8 seconds. Just as progression has been made in the skill of talented athletes, progress has also been made in the design, make up, and functionality of competitive hurdles. Ancient wooden hurdles have since been replaced by L-shaped frames with integrated counter balances which allow hurdles to fall over with pressure and eliminate the risk of injury. More durable materials are used, along with features that allow the hurdle to be adjusted to different heights. If you are searching for track and field equipment options, here are a few hurdles offered by Toadvine Enterprises that will exceed your technological expectations and leap you into competitive excellence. Gill Continuum Automatic Hurdle – This is considered the safest, fastest and most unobtrusive hurdle available for use in any competitive arena. 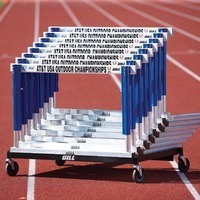 National Aluminum Hurdle – Made of aircraft aluminum, this high-tech hurdle is adjustable to 5 different heights. 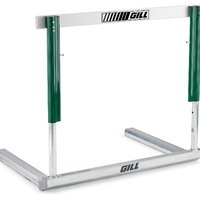 Gill Essentials Hurdle – The most economical hurdle made with no pull-over technology, this no frills equipment is perfect for a start up high school track and field team. Toadvine Enterprises supplies sporting equipment of all kinds to schools and facilites in Kentucky, Indiana, Tennessee, and Ohio. Contact us for more information about our Track and Field equipment. Is The Start As Important As The Finish? You have probably heard it said, "It's not how you start, but it's how you finish." Tell that to track athletes and they will all agree the start is just as important as the finish. If runners can improve their start times, they have just improved their chances of winning. Toadvine Enterprises carries several products that are designed just for that. A couple of products that will help with explosive starts are the Power Sprinter, the Dynamic Trainer, and the Pop Belt. 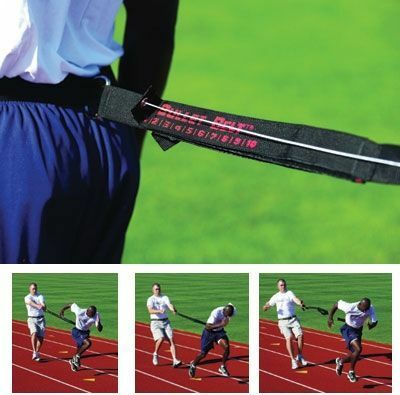 The Power Sprinter is the only arm and leg resistance running backpedal device on the market. It is great because it doesn't require a partner. It builds strength in the arms and helps with arm technique, while simultaneously creating resistance to the legs at the ankles. The Dynamic Trainer has more variety and is not limited to helping athletes with their starts. You can also use this trainer for lateral work and jumps. It not only provides resistance, but is also designed to help runners improve their start through better acceleration mechanics. Lastly, we are highlighting the Pop Belt which features break-away technology. When an athlete breaks out of the blocks using this device, they do not experience the overload and slowing from traditional resistance like the other devices create. When the trainer creates resistance it is only for a moment until the athlete breaks free through the force of their start. The resistance is not sustained because the cord breaks from the trainer once the break-away limit is reached. If you believe the start matters as much as the finish, then you should be training with the best equipment designed with the start in mind. It is all about coming out of the blocks explosively. Start getting out all your hurdles and dusting them off. Make sure you are completely prepared for this track and field season. Toadvine Enterprises has some great deal on some products that no school should go without. Whatever you need you should call Toadvine today. Toadvine has affordable options for every budget. We look forward to getting you on course for a successful track and field season. If you have seen the epic film, Chariots of Fire, you may recall the scenes where the runners are preparing for the start of the race. The runners kneel on the ground with little trowels or spades and prepare the ground. They would dig small holes for their feet to gain traction and would not slip. So much has changed from the early 20th century for track and field equipment, including starting blocks. The first starting blocks emerged in the late 1920s and became a standard and accepted practice in the 1930s. By 1937, the use of starting blocks became mandatory so runners could not have any unfair advantages and all the runners would have "a fair start." The earlier starting blocks would be large enough that the entire length of the runners' feet could rest on the block, but in the early 1970s, starting blocks were modified so the heel would overlap the top edge of the block. The thought behind this was an increased burst because of the calf muscle was more fully engaged. The former blocks were referred to as high blocks and the shorter versions are commonly called short blocks. There has been a switch back and forth to which are used in recent years, including in the Olympic games. The science behind the start is getting more sophisticated all the time, and although technology is always improving, the most important thing you hear runners saying is they need to feel comfortable in the starting blocks. 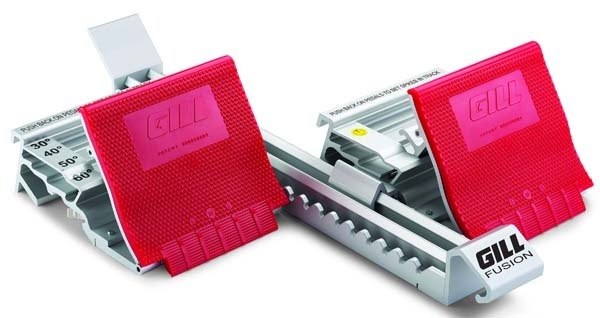 Toadvine Enterprises offers the full line of Gill track and field products. We have many great options for starting blocks in every price range, including Fusion, National, Scholastic, Moye, All Surface, and the all-important transporter starting block carts to protect your investment and make moving and storing them easy and safe. We are at the front of the science of speed and are helping schools get "faster starts through advanced technology." Call us today with your track and field equipment needs. Toadvine Enterprises (502) 241-6010.